ISLAMABAD, Pakistan (CNN) -- A devastating suicide blast struck a mosque in the strife-torn tribal region of Pakistan Friday, killing at least 51 people and wounding more than 100 others, local officials said. The casualty toll was expected to rise in the blast, which occurred near the Afghanistan border in the Bigiari area of Jamrod sub-division in Khyber Agency. This is the latest assault in a region populated by Islamic militants in Pakistani safe havens along the Afghan border, where NATO and the U.S.-led coalition have been battling Taliban and al Qaeda militants in Pakistani safe havens. While no claim of responsibility has been made for the strike, the bombing is believed to have been carried out by hard-line anti-U.S. Muslims against co-religionists seen as cooperating with the United States, other Western nations, and their allies in Afghanistan and Pakistan. As for this particular target, the bombed-out mosque had been frequented by Pakistani security officials who work at checkpoints along the supply route used by NATO to carry supplies from Pakistan into Afghanistan. The blast follows other violence and fighting this week in Pakistan. On Thursday, a suicide blast killed 11 people at a restaurant in the tribal region. That attack was most likely part of the ongoing fighting between militants loyal to Taliban leader Baitullah Mehsud and members of the Turkistan tribe, police said. And on Wednesday, a suspected U.S. missile strike killed seven people in a South Waziristan village thought to be a Mehsud stronghold. On Monday, a police officer was killed in a suicide bombing at the gate of a police station in Islamabad, authorities said. 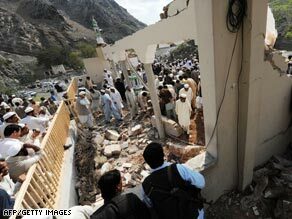 The explosion occurred on Pakistan Day, a national holiday. As for Obama, he is expected to announce new strategies in Afghanistan and Pakistan, part of an effort to defeat al Qaeda, prevent militant safe havens from developing in Pakistan and stop the militants from reasserting themselves in Afghanistan. In a background briefing with reporters on Thursday, one administration official painted a somber picture of the al Qaeda threat. "Al Qaeda's central leadership has been moved from Kandahar, Afghanistan, to a location unknown, somewhere in Pakistan," he said. "And in that location, they're plotting against the United States. They are working with their friends and partners, the Taliban, others, against American interests." Senior administration officials said Obama plans to send another 4,000 troops to Afghanistan along with hundreds of civilian specialists. Obama also will call on Congress to pass a bill that triples U.S. aid to Pakistan to $1.5 billion dollars a year over five years, the officials said. The troops -- which are in addition to the 17,000 the president announced earlier would be sent to Afghanistan -- will be charged with training and building the Afghan Army and police force. The plans include doubling the Army's ranks to 135,000 and the police force to 80,000 by 2011, the officials said. Earlier Thursday, Director of National Intelligence Dennis Blair told reporters that the United States needs to improve its level of intelligence support for military operations in Afghanistan. Blair also said a lot more work is needed to get Pakistan on the same page as the United States in fighting terrorists along the border.